The four very important things that make us special…..
We are all about caring for children and understanding what makes them tick. We aim to keep them safe, whilst at the same time, educating them, so those important next steps into school and life beyond are made as natural and as easy as can be. We want to make each day special for your child. Every day with us is different. Children play, sing, dance, paint, read and lots more. They climb and run about outside, but they can also take time out, to rest, to relax and when they feel like it, just simply dream. Our staff tend to stay with us because we care about them also. The majority of our practitioners are qualified and those who aren’t are heading towards a childcare qualification – we are very choosy about who comes into our Kindergarten, all of our staff are first aid qualified, so you know your child is safe with us. Our three stage security – our Nursery has an electronically controlled security gate to the site, an access controlled door and a securely monitored CCTV system to ensure the safety and well-being of all children and staff. Our simple philosophy ensures your children are nurtured, cared for and inspired; so whilst we take care of that you can happily get on with your day. Our aim is to provide a stimulating, caring and happy environment to enable each child to develop an appreciation of personal worth with confidence in their own ability. We will work with your child to encourage sensitivity to the feelings and opinions of others and to develop habits of self discipline and acceptable behaviour. The nursery aims to provide for all needs of the developing child. We provide learning experiences through an essential pre school curriculum plan closely following guidelines from OFSTED to help your child develop and work towards achieving the ‘Early Years Foundation Stage – Birth to Five Years’ (EYFS) requirements. During their time with us your child will cover the seven areas of learning identified in the EYFS. They will have the opportunity to develop their emotional, personal and social skills. They will develop their language, literacy and mathematical abilities and to gain a broad understanding of the world and the environment around us. 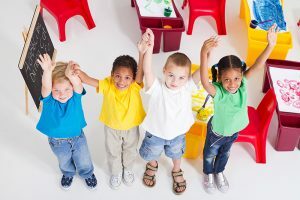 Your child will be able to extend their physical capabilities and express themselves through activities including dance, music, art and design, creative play and computer skills. We encourage parental involvement and encourage strong links with the home. Parents receive a report each term detailing their child’s level of development and the plans for the next steps in their progress. Parents are actively encouraged to work on these at home. We use a tablet based observation system to record and monitor each child’s individual progress. Parents are encouraged to discuss any questions they may have regarding their child’s development and progress with their child’s Key worker. Kindy and Tweeny parents are invited to regular parents’ evenings. It is our policy to contact parents whenever there is concern about a child, but we’ll also try our best to let you know when they do something special! Our aim is to make the nursery a happy place and that the children enjoy being here, whilst endeavouring to ensure that they achieve their full potential. In order to do this we often need parental support, the more information you can give us about your child the better. Where children attend more than one setting we liaise closely with the other setting to exchange information. We will also ask for your input to keep us informed on how your child is are getting on at home by collecting detailed information when they join us and then sharing our observations with you once they are with us. We hope your child has a happy time here at Howley Grange Kindergarten and that we will have made the transition to school a very natural progression. We are very aware that every child is unique and know from our many years of experience that children develop at their own pace. Each child will reach milestones at different times within their peer group. We work closely with parents and with local authority experts to identify and assist any children who require a little bit of extra support. Staff have completed Makaton sign language training to assist those who need a little extra support with communication. Priority is given to those families requiring full time care and full days, then to those requiring half day sessions. The only exception will be sibling links, when the continuation of the older child at nursery is dependent upon the younger sibling gaining a place. Sessions are offered on a flexible basis, based on availability. In the event of oversubscription a waiting list will be kept and dealt with in date order using the above criteria. In order to be put on the waiting list parents will have to fill out a Registration form and pay a non-refundable deposit. Please note the minimum booking is two half days or one full day. We will occasionally be able to offer a half day session, but we strongly advise parents that this is not in the best interests of the child. Such a place will only be offered subject to availability.